This fascinating letter by Baptist missionary Jotham Meeker describes recent Ottawa converts to Christianity and the Ottawa chief Ottowukkee's passionate stand against further missionary efforts. Apparently, just as Ottowukkee was about to drive the missionaries out of the area, he was struck by a sudden illness. According to Meeker, many of the Ottawa believed his sickness was a sign of God's judgment. 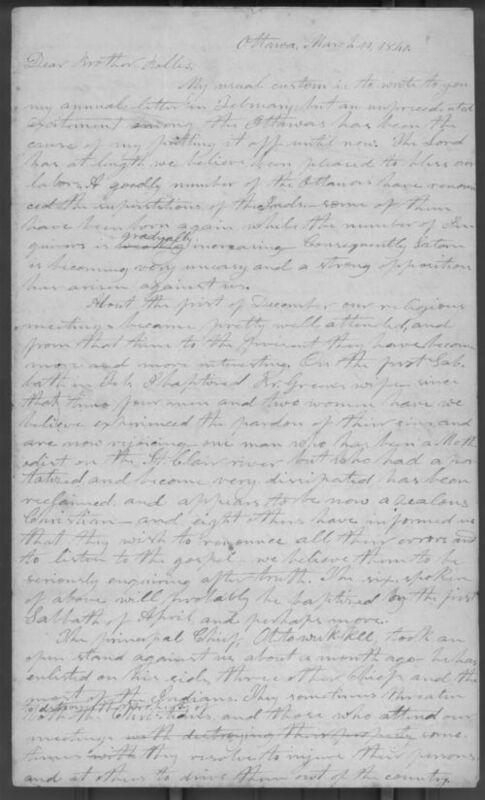 Also, Meeker discusses David Green, a native convert who has joined Meeker as a missionary at the Ottawa Mission (near present-day Ottawa, Kansas). The recipient of this letter, Reverend Lucius Bolles, was Meeker's contact on the Baptist Board of Foreign Missions. This source demonstrates missionary efforts to "civilize" the Ottawa Indians by imparting Christianity and white moral values. It also shows how the Ottawa, like other native tribes, continued to adhere to traditional ways. This letter works in tandem with the July 8, 1840 letter in the Meeker Papers (also selected for this standard) to teach change over time.